As a result, the programme offers a unique series of informal, interdisciplinary one-day workshops covering the broad topic of agri-food. The seminar series gets underway on World Food Day with the inaugural workshop being held at the University of York on Tuesday, 16th October. Vikki Wright, grants and finance co-ordinator for N8 AgriFood, who is overseeing the series, said: “In the past much of the training activities we have offered students have been built into our annual conference. “However, we wanted to do something specifically for students, so we came up with a seminar series. 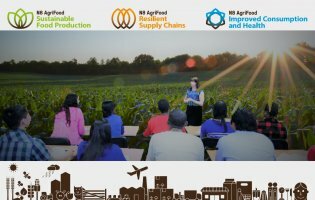 “We have asked each of the eight institutions to come up with a topic so we have ended up with a diverse spread across each of the three themes of N8 AgriFood. “We wanted to galvanise the network of 470 PHD students studying across our universities so they feel like they are part of something bigger, and work as a cohort. “They are the researchers of the future, and if we can get them to work across the eight institutions then they are more likely to look to those networks in the future. It’s laying the foundations of collaborations in the future. “We’re offering students the chance to meet like minded people and hopefully make connections with people doing research in the areas that interest them. Fed into the seminar topics is the results of a doctoral student survey, which revealed an interest in career journeys among industry and academia, and networking opportunities. The first event in York, held at the Berrick Saul Building, features a line up of interactive and participatory sessions for doctoral students to engage with senior academics to discuss global food systems, designing research for impact and options for career pathway. Professor Bob Doherty said: “The global food system is under enormous strain – climate change and a range of other factors, including an anticipated population growth (more than 9 billion by 2050) and the degradation of ecosystems is making it increasingly difficult to meet the global demand for food in a sustainable way. The next event in the seminar series is being held at Newcastle University on Thursday, 6th December, and will focus on consumer perspectives on food fraud and the subsequent implications for the food industry. The series will continue in the new year with a seminar at Manchester on February 15. The topic is set to cover precision agriculture, remote sensing and autonomous robotics for agriculture and food. Dates are being scheduled throughout the year for seminars at Durham, Liverpool, Lancaster, Sheffield and Leeds. See the N8 AgriFood website for updates and details of future seminars or follow us on Twitter @N8agrifood, on Facebook @N8agrifoodprogramme or via LinkedIn under N8 AgriFood.